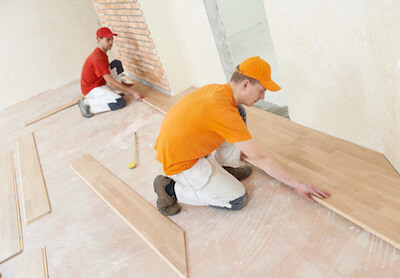 Hardwood flooring has become the norm in homes all across the Denver Metro area. Hardwood flooring is by far the preferred choice in mid to higher end homes. But what if you have an older home and hardwood only exists in a few rooms? What if you only have hardwood in one – the kitchen, the entryway, the family room, or just the main living space? The good news is that it’s usually fairly easy to match existing hardwood and create a harmonious look. Do you have solid or engineered hardwood floors? It’s much easier to match if you have solid hardwood flooring. Solid hardwood is good for both longevity and flexibility in color matching. In most cases, solid hardwood runs ¾ inch thick. With a subfloor built in, you have flexibility in being able to lay hardwood flush against existing hardwood, matching it up plank by plank. Be sure the subfloor height is consistent throughout the space to ensure hardwood will be even as you move from room to room. What species of hardwood is in place? Next, identify the species and grade of the hardwood in place. In many homes, oak hardwood is a standard. But of course, there are many other options available. Even with oak, there are two options: red oak and white oak flooring. If your home was built in the early twentieth century, maple, douglas fir and yellow pine were all common place. And if you have a newer design, additional hardwoods have been used over time. Also keep in mind that even with different species, the cut of the wood also comes into play. Identify what grade of wood was used to ensure a proper match. This is usually the simplest to figure out. With a tape measure, measure the current width of your wood. Most homes are built with a standard 2 ¼ inch strip. Oak flooring can also come in 3 ¼, 4 or 5 inch strips. Can you change it up? Anything is possible. Just keep in mind the aesthetics may change if you adjust size from room to room. With hardwood, you can adjust coloring to match once your new hardwood planks are in place. In general, if you have oak hardwood flooring, and choose a match of both species and grade, simply by refinishing the wood and staining will provide you with the overall look you desire. Matching without redoing the entire floor space can be difficult, especially if the two kinds of wood aren’t the same species or grade. A professional can help you decide the best route for the look you desire throughout your home. Not all flooring has to match. In some cases, it’s better to make a transition as you move from space to space. Transition strips can help you adjust heights in doorways or change directions in the direction of wood. It can help you change colors from space to space. Are you trying to add more hardwood to your existing home? What challenges have you faced?